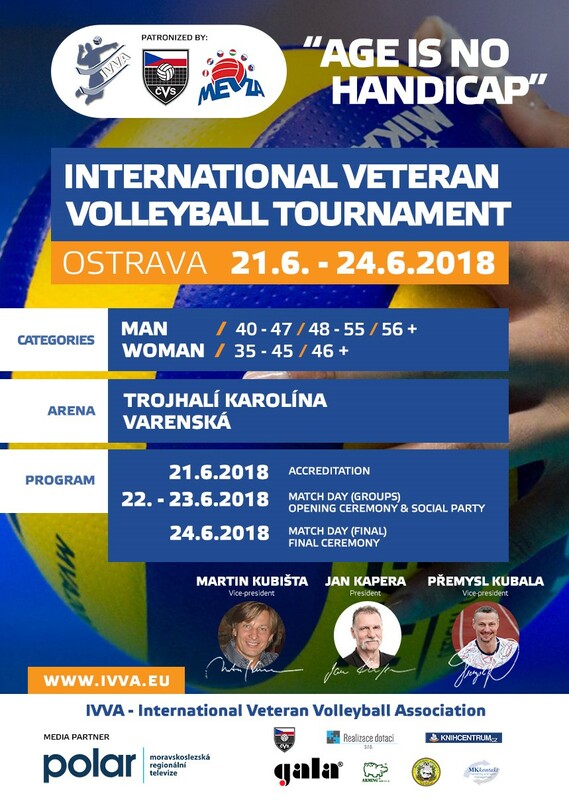 on behalf of our association I would like to invite you and your friends to the International Veteran Volleyball Tournament 2018 which will take place in the city of Ostrava - Czech Republic from 21.6. till 24.6.2018. The tournament is organized by an emerging association IVVA (International Veteran Volleyball Association) in cooperation with Czech Volleyball Federation and Middle European Volleyball Zonal Association. In 2017, we had all together 26 teams from 10 different European countries participating in our tournament. Watch the short 2017 aftermovie on youtube here. We are giving you and your volleyball friends the opportunity to test your skills and compete against other volleyball "veterans" from all over the world. The tournament is designed for both former professionals and volleyball amateurs for whom volleyball is simply a passion. Don’t miss your chance and come to Ostrava for this great sporting event. You can find an event poster in the appendix. Please feel free to share this Invitation letter with all the volleyball enthusiasts around you.